This past week was the Raleigh International Festival. This was my first time going. I was concerned that the traffic would be bad and there would not be parking. I arrived a few minutes before the 11 o’clock start time, and easily found a parking spot in the garage next to the event. It was a short walk across the street and I was in the venue. I had pre-purchased my ticket and was pleased that there was a short line for us. I started talking to the woman in front of me. She was from Romania. She stated she had been to the festival yesterday and had returned today. She began telling me about the food. She said her favorite thing from the day before was the Columbia arepas, which are corn cakes made from pre-cooked corn flour, salt and water, cooled then cooked on a griddle. A sandwich is made with chicken or beef. She said there was a great tomato sauce. She said it was the most popular food booth yesterday and that they ran out of food. I knew that I must try it. Inside there were many booths, some selling items made in their country, while others were informational. Tee shirts were for sale and of course I had to get one. I also purchased a cookbook, which vendors from the previous year had contributed their recipes. It was time to start looking about what I wanted for lunch. There was so much to choose from. 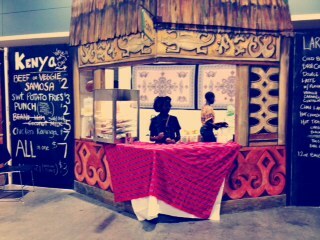 The first booth was an African booth, they had samosas stuffed with either beef or peas. Since I hate peas, I selected the beef and it was wonderful. A soft flakey crust with delicately seasoned beef inside cooked to perfection. Nearby was a Filipino booth. They had a vegetable pancit, made with rice noodles, carrots, onion, cabbage and bell peppers. I was somewhat disappointed because I wanted pancit with beef, pork, shrimp and chicken, like I had when I lived in New Jersey and had many Filipino friends. I have never been able to make it myself, and was hopeful I would get a good sampling. The vegetable was okay, but the other is spectacular. I also wanted a beef lumpia roll which is a Filipino egg roll, this is better than the traditional egg rolls, however all they had was chicken, so I passed. 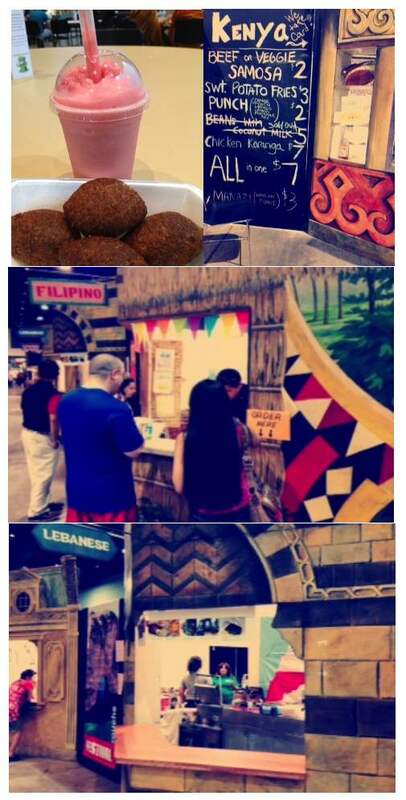 There was Thai food, Greek food, French pastries, Iranian food, Japanese food – then I came to the Lebanese booth. I saw they had Kibi on the menu. There are several types of kibi and was happy to find that they had the stuffed shell kibi. The outter shell is made with bulgar wheat and finely ground lamb along with some spices. A ball is formed, then hollowed out in the center to allow for the placement of ground or chopped lamb, onion, pine nuts and seasoning. It is then fried to a nice golden brown. I ordered it, and it looked great. I tasted it with some tzatziki sauce made from cucumber, garlic and yogurt and I felt transported back to one of my favorite restaurants in Tucson, Arizona called the Shish Kabob. I could taste and smell the humus, baba ganoush a wonderful dip made from egg plants and sesame paste and the meat stuffed grape leaves. I looked for these items, but came away empty handed, but the wonderful kibi was enough. My next stop was the Columbia booth. I had to try the arepas. However it was not meant to be because, they had to make everything from scratch and would not have the beef ones ready for nearly 1-2 hours. I went away empty handed. The vendor, stated he sold these items out of his home to order, however he did not have any business card to give me. Next door was a Polish booth who was selling pierogies. I asked what kind he was selling and he stated he had only made the potato and cheese, since they were the most popular. I had gone to a Polish restaurant in New York City, close to Macy’s that had both savory and sweet pierogies, ranging from prunes, to cherry to mushroom to sauerkraut, that were fried with butter and onions. My final stop was to the Vietnamese booth, to get some bubble tea. This was not the bubble tea that I was accustomed to. This was a strawberry sorbet with some large tapioca at the bottom. It was not too sweet and made a great end to the food sampling. There were food demonstrations; the one at this time was for Pad Thai. There were also dancing from the various countries and people dressed in their traditional costumes. I was glad that I had stumbled on to this festival and will definitely plan on returning next year.